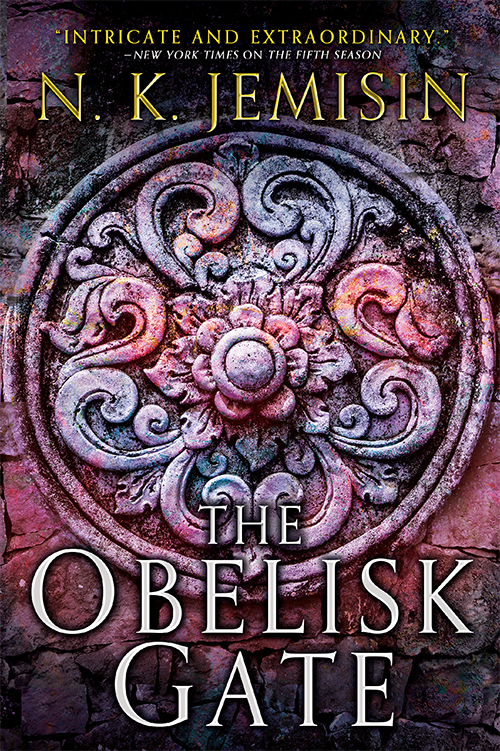 The Obelisk Gate cover reveal! 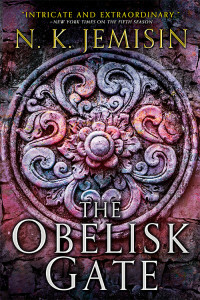 If you haven’t seen it yet via Twitter or Facebook, the Mary Sue is today featuring an exclusive (well, except for here) reveal of Book 2 in The Broken Earth trilogy: The Obelisk Gate. Of which I just finished the raw “zeroeth” draft about two weeks ago. Should be turning in the first draft today or Monday. After that it’s anyone’s guess as to the release date, but considering I’m turning it in literally a year after the publication of the first book, my guess is roughly a year before Book 2 actually comes out. I’ll tell you when I know more. So… behold! Click to enlarge. Lovely, isn’t it? This one was done by Wendy Chan, a senior designer at Orbit. Descriptive copy uh doesn’t exist yet, but I can cautiously tell you that Essun’s story will of course continue; you’ll find out what happened to Alabaster and why he Did The Thing; and you’ll find out what’s happened to Nassun, Essun’s daughter. Curious: Is the color scheme a reference to the amethyst obelisk, or just a coincidence, or something else entirely that you cannot divulge at this time? I’m looking forward to this. The Fifth Season has really stuck with me, and I’m eager to see what happens next. At the same time, you managed to give me a complete story, so I’m not feeling like I was left in the lurch. And yet, after thinking it over, I have so many questions! So I hope I get to read The Obelisk Gate soon after it arrives. The cover is beautiful. My compliments to the artist. Orbit is giving you very architectural covers. I like them–in fact I like them enormously–but I wonder why they do it. It’s not where my mind would have gone for your books. Of course, that may be one of the many reasons I’m not in the visual arts. Anyway, this one is lovely. The colors make me think of dawn. Oh my gosh, this news came at the right time! I usually just lurk, but I have to let you know that the end of The Fifth Season had me howling with thwarted anticipation! TFS was so perfect, I just can’t even (although I’m probably fangirling a bit here). I just know The Obelisk Gate is going to make me insane as well. Looking forward to it! Hoping to learn more about Tonkee as well. Oh dear. Alabaster needed *more* motivation than he already had to Do The Thing? By the way, I loved The Fifth Season so much that I immediately found and read the first book of the Inheritance Trilogy. The library better also have the remainder, because I will surely need to read them as soon as possible when I get back from my business trip next week.